With decades of 3D CAD design experience, Outsource2india provides superior 3D part modeling services to our ever-increasing list of satisfied clients. Outsource2india's customer-centric approach allows us to focus on defined concepts and requirements while providing precise modeling services. Our modelers and draftsmen opt for AutoCAD, 3D Studio Max and Sketch-up to produce vivid 3D models that are highly professional and thorough. Not just at surface modeling, we are also proficient in migrating accessible CAD data from any specified platform to the other. We provide both detailed and exploded view to help you understand the complexities and intricacies of the designed parts to get a clear idea about its uniqueness. 3D Fixtures Modeling - Multi-view representation and modeling for various machine parts, jigs, automotive parts, etc. At Outsource2india, we follow stringent quality standards ensure that only professional 3D modelers with a minimum of 5 years of experience work on your project at any given time. This allows us to generate a 3D part model which can be modified at any given time, allowing you to take charge of any alterations without spending excessively on different prototypes. 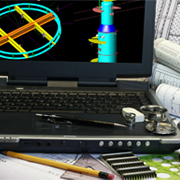 What Makes Our 3D Part Modeling Services Stand Out? At Outsource2india, our stringent quality standards help us provide comprehensive 3D part modeling services that meet client needs and come within a specified budget. Our models are highly flexible and can be modified depending on requirement. We focus on shortening the design lifecycle of your projects and streamlining the manufacturing process. By providing precise 3D part models at competitive prices with reduced turnaround time, Outsource2india is a smarter choice. We are always excited to take up new and challenging 3D part modeling projects. If you have any requirements that need a 3D modeling service partner, we are here to help. We would love to assist you with your 3D part modeling requirements. Have a look at our mechanical services portfolio and contact us for to more about our 3D part modeling expertise. Do feel free to get in touch today to know how we can help you out.